Tales Of A Nomad: Tranquillity...!! A serene water tank. Hampi. September 2009. Wow, this is absolutely beautiful! LOVE it! Nice pic dude. Hampi is one place I somehow missed. most foreign travellers have 2 places on their agenda wenever they visit India, one is Pushkar and the other is Hampi. Hope to visit it sometime soon. Thank you. Hope you are able to comment now. Splendid. The black and white does justice to the place. Great shot. 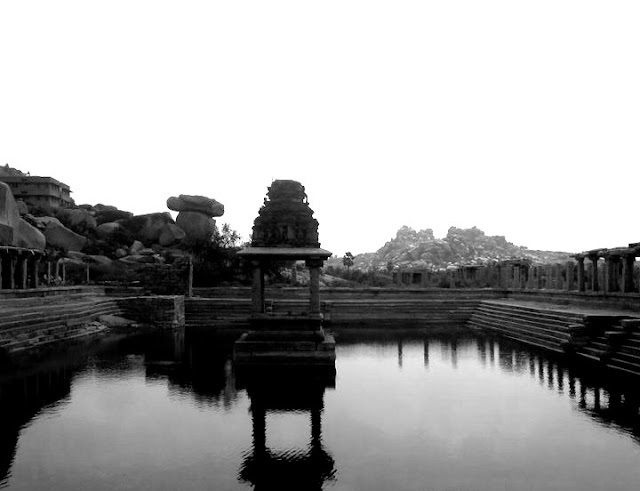 I badly wanna visit Hampi. Thank you. It is a must visit destination rich in history and architecture. Beautiful image ... beautifully titled ..
Beautiful! Only a tranquil mind can appreciate tranquility outside.